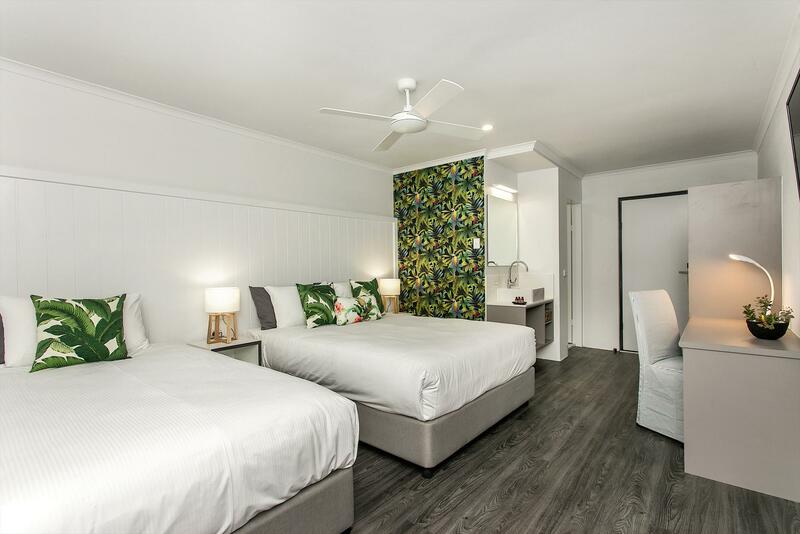 Don't let the 'Motel' name fool you; this boutique accommodation oozes coastal style and relaxed contemporary cool. 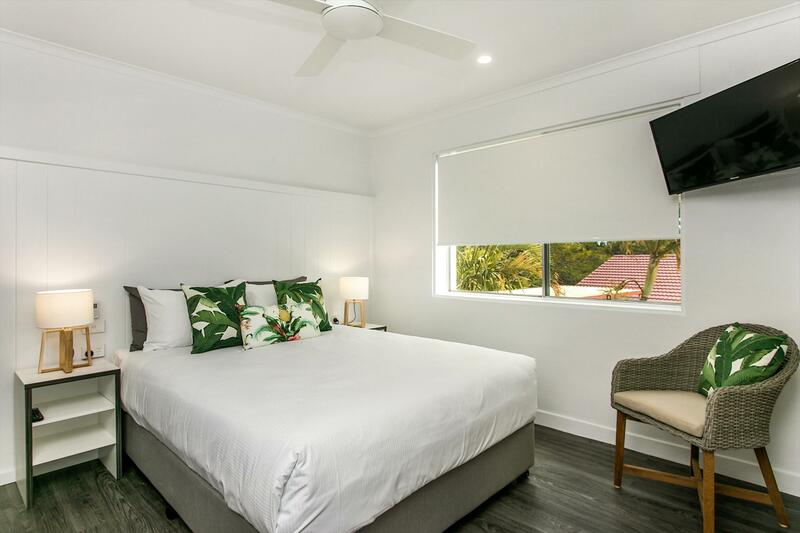 Brunswick Heads Motel offers contemporary boutique accommodation on the New South Wales North Coast in the coastal village of Brunswick Heads, just 20 minutes north of Byron Bay. 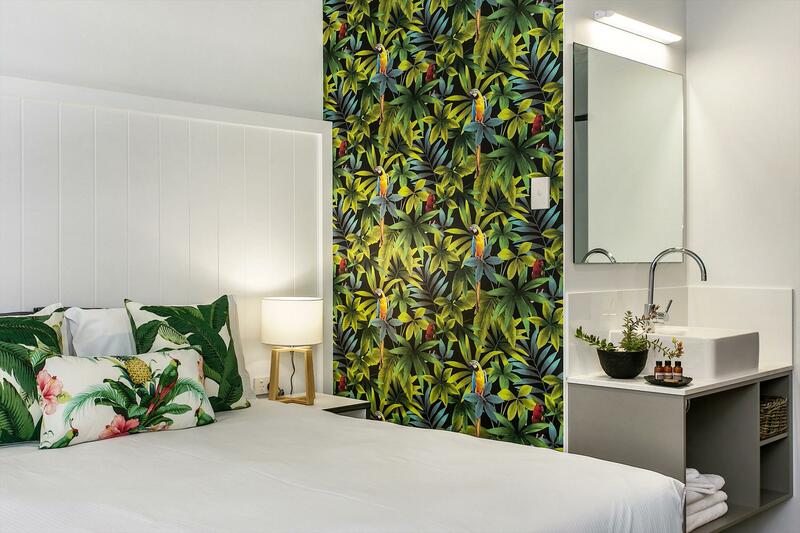 Recently renovated, each room at Brunswick Heads Motel features stylish tropical décor. Each room has a flat-screen Smart TV, which is enabled for Netflix. There is a seating area where you can relax and a well-stocked mini-bar filled with quality, locally sourced products. Rooms have a private bathroom and Tommy Bahama amenities. The hotel boasts a swimming pool to enjoy during the warmer months and complimentary hire of Bondi Cruiser Bikes and Stand Up Paddle Boards. Guests can enjoy continental breakfast poolside with choice of quality ingredients including seasonal fruit, Brookfarm muesli, organic croissants and artisan breads. 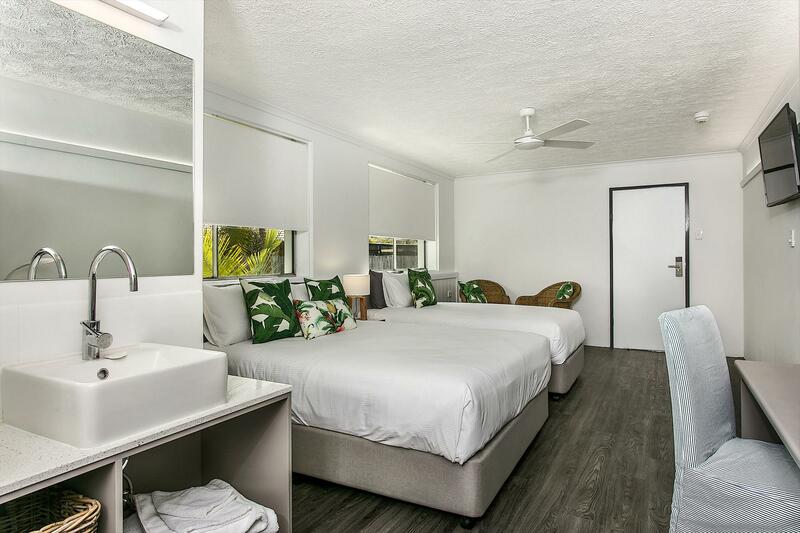 Brunswick Heads Motel is the perfect choice for couples looking for a coastal cool getaway. If you are travelling south towards Brunswick Heads from Queensland, follow the Pacific Motorway/M1 to Old Pacific Highway in Brunswick Heads. Take the exit towards Gulgan Rd/Brunswick Heads/Mullumbimby from Pacific Mwy/M1. At the roundabout, take the 1st exit onto Tweed Street/Old Pacific Highway and travel approximately 1.3km through Brunswick Heads. The motel will be on your left hand-side across the road from the Caltex Service Station and Massey Green Caravan Park. If you are travelling north to Brunswick Heads when travelling on the Pacific Motorway/M1 travel past the exit to Byron Bay and continue on the Pacific Motorway/M1 for approx. 10km. Take the exit towards Gulgan Rd/Brunswick Heads/Mullumbimby from Pacific Mwy/M1. At the roundabout, take the 3rd exit onto Tweed Street/Old Pacific Highway. At the second roundabout take the 1st exit on to Tweed Street/Old Pacific Highway and travel approximately 1.3km through Brunswick Heads. The motel will be on your left hand-side across the road from the Caltex Service Station. Please note the property does not have the ability to provide additional bedding or cots for any of our guest's rooms. Please ensure that you have booked the correct room type for your needs. guests removed from the premises without refund. Visitors are not permitted to the property after 9pm. The property is a licenced venue and alcohol brought onto the property is not permitted. There is a fully stocked mini bar in each room for guests consumption or liquor can be purchased through reception. A spacious room with one queen bed and one king single bed, armchairs and ensuite. This room suits travellers requiring twin bedding or a family. A maximum of 3 guests for this room type. The Queen Suite is a spacious room with queen bed, arm chairs & coffee table, dual access and ensuite. This room suits a single traveller or couple. A maximum 2 guests for this room type. The Queen Suite is a spacious room with queen bed, armchairs, dual access and ensuite. This room is located on the ground floor and has its own courtyard with pool or garden views. This room suits a single traveller or couple. A maximum 2 guests for this room type. With a queen bed and ensuite this room suits a single traveller or couple. A maximum 2 guests for this room type. Room includes complimentary high speed wireless internet, Smart TV with WIFI access, desk, ceiling fan, bar fridge, hair dryer, iron / ironing board and jug, tea & coffee making facilities. 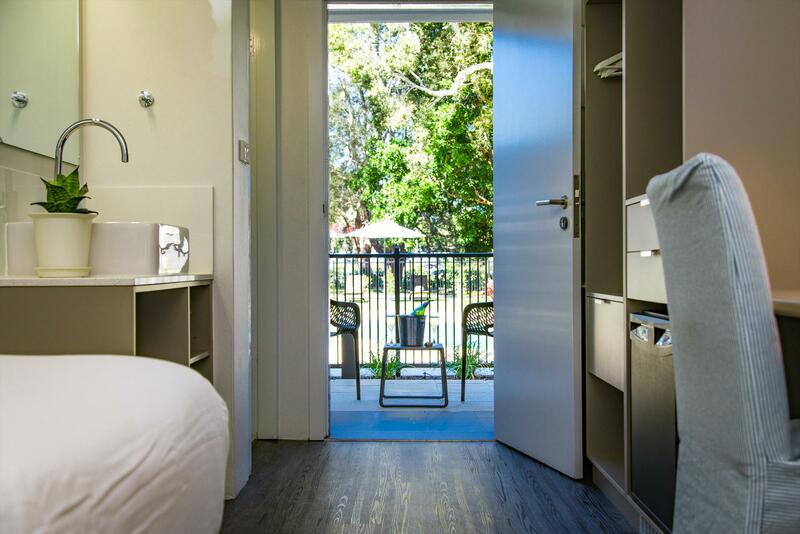 A spacious room with one queen bed and one king single bed, dual access and ensuite. This room suits a couple, travellers requiring twin bedding or family of three. A maximum of 3 guests for this room type. 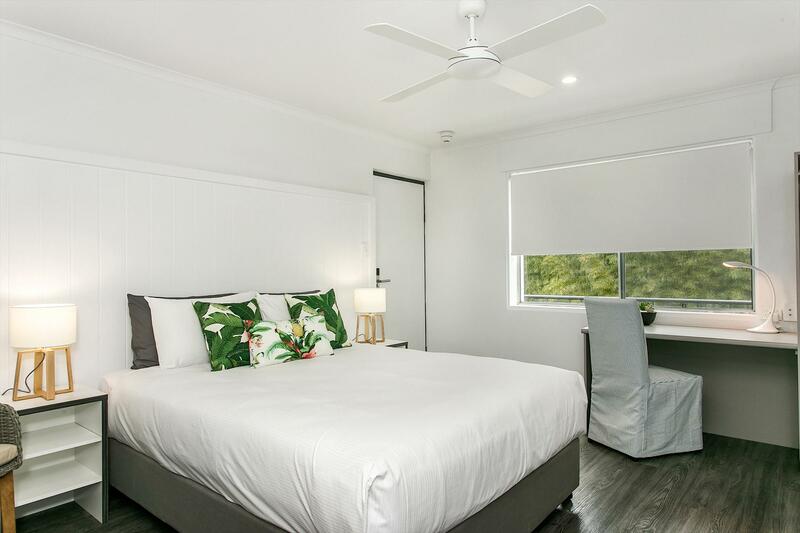 A spacious room with one queen bed in the main room and one king single bed in a separate second room, dual access into the rooms and ensuite. This room suits travellers requiring twin bedding or a family. A maximum of 3 guests for this room type.